The other day I watched an interesting TV program. The show profiled three Japanese people who have succeeded at their professions overseas. I was especially impressed with one of them, so let me tell you about the man’s story. His name is Masafumi Hamano. He is a French chef who runs a Michelin starred restaurant. In France, there are some Michelin starred restaurants run by Japanese chefs. Most of the restaurants are located in major cities or popular tourist resorts. 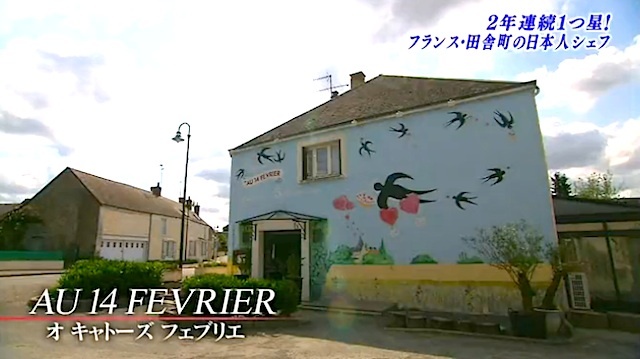 However, Masafumi’s restaurant is in a very small village of 280 people. In the little village of Saint Valentin, a three hour drive from Paris, sits the petite restaurant named “AU 14 FEVRIER” (which means February 14th). 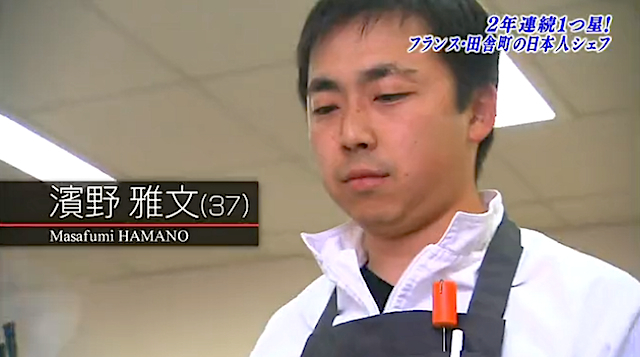 Masafumi trained for nine years under Hiroyuki Sakai, one of well-known iron chefs in Japan. And in 2004, when he was 29 years old, Masafumi challenged himself by journeying to Lyon. At about that time Saint Valentin was suffering from depopulation and their village’s only restaurant was in danger of going out of business. Pierre, the village headman, caught word of Masafumi’s good reputation and asked him to come and breathe new life into the restaurant as the master chef. Masafumi readily accepted Pierre’s offer and opened AU 14 FEVRIER in 2005. To my surprise, the AU 14 FEVRIER’s employees are all Japanese. At first Masafumi, of course, worked with a French staff…but it was a trouble. Highly motivated local staff usually aim for working at better-known restaurants in bigger cities such as Lyon or Paris. Thus, they move on quickly. It might prove very difficult for Masafumi to persuade skilled French workers to stay in Saint Valentin. So, as a last resort, Masafumi tried putting out the call for reliable Japanese staff. It worked. Carefully selected fresh, quality ingredients and elegant dishes cooked with Masafumi’s distinguished skill and creativity began to attract the French gourmet clientele. Unlike typical restaurants of its kind, AU 14 FEVRIER offers a one course menu with 18 (as opposed to the normal 12) kinds of dishes and changes the menu 8 (rather than 4) times a year. And finally in 2012, AU 14 FEVRIER was awarded one star by Michelin guide. Masafumi is not alone in facing obstacles while residing and working in a foreign land. His wife, Aya, also has been struggling to adjust to life in Saint Valentin. She says at first she was very anxious about raising a baby there, but later she finally resolved herself. What gave her courage was Pierre, the village headman, and his wife’s love. They always care about Masafumi and Aya just like real parents and have made her feel at ease. Now Masafumi and Aya have a son, and the boy calls Pierre “French grandpa”.